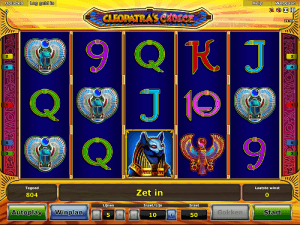 This is another great Novomatic Casino slot with an ancient Egyptian theme. If the mysteries of the gods, pyramids and symbols intrigue you, Cleopatra's Choice is just the game for you. Also, you may like Book of Ra, Book of Ra Deluxe and Book of Ra 6 for their mysterious Egyptian themes. With only five pay lines, five reels and three rows, your winning opportunities are simplified. Do not let the signature Novomatic design simplicity give the impression that this game's visual quality is simple. The slot's graphics are crisp and advanced. There are animations at the beginning of the game and throughout as you uncover mysteries. The reels spin smoothly, and the game does not freeze on most devices. If there is a glitch during a spin, the host casino should not charge you. This game is compatible with most operating systems and most mobile or PC browsers. Since the game has the same no-nonsense setup as Cindereela, Lucky Lady's Charm, Columbus and others, it is easy to learn quickly. Also, you can play it in practice mode with a demo balance until you are familiar enough with it to bet real money. The game starts after you set your bet and click start. To set your bet, choose a number of lines to bet on. You can choose between one and five using the arrows for the line box at the bottom of the screen. To adjust the coin value per line, use the arrows on the bet/line box. This number is multiplied by the number of lines chosen to bet on. The total amount is wagered during each round unless you change the bet levels between rounds. Your current bet is displayed to the right of the adjustment boxes. To see a detailed list of values and characters, click the paytable button at the bottom of the screen. In this game, the mysterious Cleopatra is the wild symbol. She substitutes for any other symbol except for the scatter and bonus symbols. Spin two or more of her to win a coin reward. You can win between 100 and 50,000 coins depending on how many Cleopatra symbols appear on a pay line. The bonus and scatter symbols provide other rewards, which will be covered shortly. The other high-value symbols are Anubis, a phoenix and a scarab. Anubis is worth between 500 and 25,000 coins depending on how many symbols appear on a pay line, and the scarab and phoenix are worth between 200 and 5,000 coins when three or more appear on a pay line. Low-value symbols are the higher faces of a standard deck of cards, and each one is symbolised by the corresponding letter or numeric value. Low-value symbols are worth between 20 and 1,500 coins depending on the symbol and multiple spun. The Eye of Horus is the scatter symbol. Cleopatra's Choice differs from most slots since scatters do not earn you free spins. If you spin three or more of this unmistakable golden tile, you must pick one of the tiles. The prizes behind the tiles are randomised, and you can win up to 1,000 times your bet. A golden mountain tile may also appear on a win line. If you spin three or more of it, you may win up to five bonus picks. Picking a tile gives you the chance to multiply your win and to enter the bonus room. A popup screen appears with several sets of golden doors. You must pick a room, and the door will open to reveal an overflowing vase of gold. The value of your treasure is displayed below the door and varies. You could win 20 euros, 200 euros or even more. As it is with Caribbean Holidays, Flame Dancer and other slots, you have the chance to multiply your current win with the gamble bonus. By gambling your current win, you will either double it or lose it. You must predict whether the next card on the gamble screen will be red or black. If you guess correctly, you can gamble your win again to double it. For example, if you won 50 coins during regular play and won 100 coins from gambling 50, you would win 200 coins during the next gambling round if you guessed correctly. You can adjust the sound level or turn the sounds on and off by using the speaker icon at the top of the screen. Play the game in full-screen mode by clicking the expansion button at the top of the screen. Click the arrow button if you want to spin the reels faster. To slow them down again, click the button a second time. Also, this game has auto mode. Click autoplay at the bottom left side to spin the reels nonstop. You must click stop to manually exit auto mode. There are no options for setting a win/loss threshold or a desired number of rounds in autoplay. If you like the fast-paced thrill of higher stakes and betting, try Novomatic's electronic sic bo, baccarat or roulette table games. There are also plenty of other slots with massive jackpots and generous pay lines.